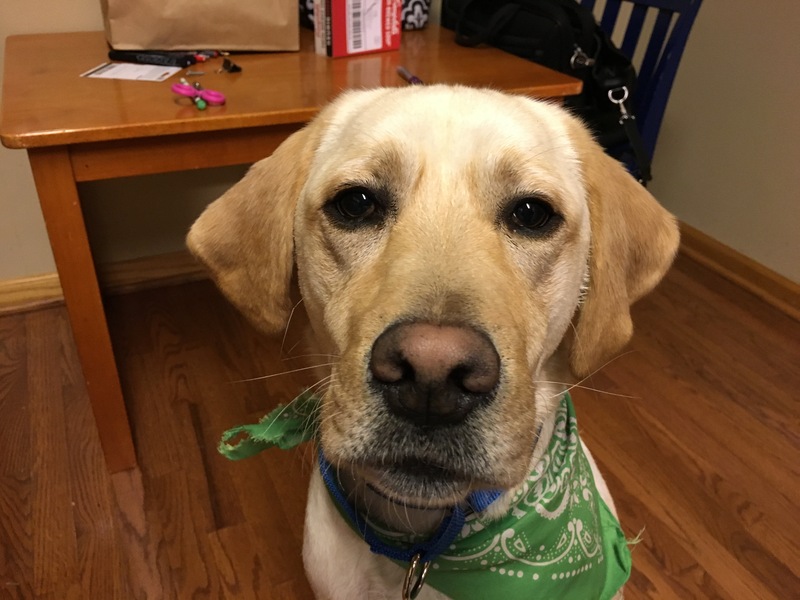 Otis is a three-year-old Yellow lab in Omaha who doesn’t always listen to his guardians, pulls on the leash, barks and is reactive to other dogs. It only took a few moments to see that Otis needed some structure in his life. He showed no respect for the personal space of anyone in the room; jumping, wagging and rubbing himself all over them. Compounding the issue, all the members of his family petted Otis whenever he demanded it by nudging, scratching or jumping up on them. All of these activities and behaviors told me that the dog did not respect the authority of the members of the family. Because he didn’t see them as authority figures, Otis did as he pleased and ignored them when they corrected him and he disagreed. I suggested that the family start practicing what I call petting with a purpose; petting the dog for setting, coming or laying down on command. By making the dog earn their attention or affection, the members the family can continuously reinforce the leader follower dynamic that they want without even thinking about it. To help them in this regard I showed the members of the family how to disagree with Otis’s unwanted behaviors as well as how to reclaim their personal space. By claiming their personal space on a consistent basis, the members of the family can communicate to Otis that he needs to be more respectful while interacting with them. While there’s nothing wrong with hugging a dog, petting it or getting right next to it when the humans want. But in Otis’s situation, he thought they were there for his amusement. Otis responded to the new corrections immediately and adopted a more subdued behavior and energy. I love it when dogs react this quickly. To help the members of the family practice using the escalating consequences and new nonverbal communication cues that I had shown them, I walked the members of the family through a leadership exercise I developed a few years ago. One of Otis’s most troublesome behaviors occurred whenever anyone knocked at the door or came into the home. When dogs live in a pack, it’s the authority figure who is generally in charge of security and protection. Because Otis had appointed himself sheriff of this family, I knew it was important that we communicate to him that his services were no longer required in this capacity. I handed my camera to one of the boys and demonstrated how to clean the area around the front door while someone knocked. By asking the dog to remain behind the human, it literally starts to see itself as being in the follower position. Additionally, the added buffer of space between the dog in the door can be beneficial in helping the dog learn to not get so excited. Often dogs get overexcited when people come into the home because these people immediately stop and pet the dog. This interaction actually encourages this overexcited behavior. For this reason I suggested that the members of the family ignore Otis completely when they return to their home. By only petting Otis when he is calm, and ignoring him when he is excited, his guardians can communicate to him that a calm energy is the only way they will interact or provide him with affection. If they are consistent in this application, Otis will quickly adopt a calmer demeanor when people arrive at the door. Next I had Otis his guardian practice answering the door using the techniques we just finished going over. After working with well over 1000 dogs I’ve seen all sorts of energies, personalities and behavior. Otis really took to heart the new rules boundaries and limits that we put into place. By the end of the session he no longer invaded people’s personal space, he was obediently listening to the commands from his guardians and looking at them in a more respectful way.